One of the highlights of our job is getting a new job back from the printers – it’s very exciting to see your work come to life! If you are unfamiliar with the print industry however, it can be tricky to know which type of printer and print technique to use. With this in mind, we have put together this simple guide to explain some of the more common printing techniques. 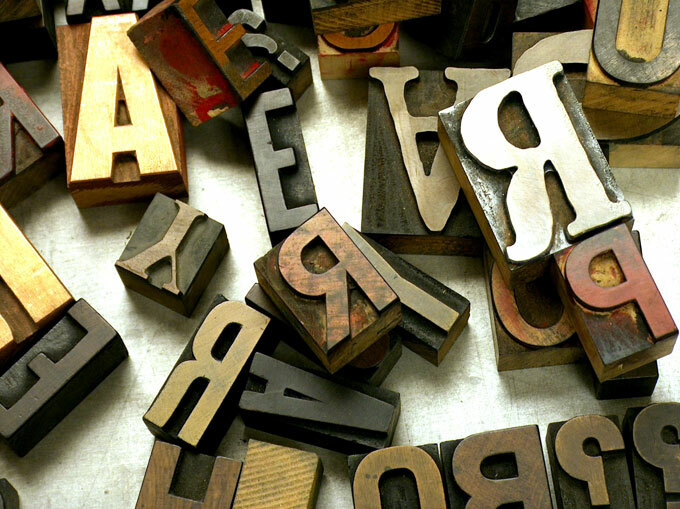 Letterpress is the original commercial printing technique. Letterpress is a relief printing technique, this means that a raised surface has ink applied to it which is then pressed into a sheet of paper. The raised surface could be wood or metal type, an engraved plate or even a woodcut. Johannes Gutenberg’s famous printing presses, which sparked the Printing Revolution in Europe in the 15th century used the letterpress technique, and letterpress remained the main printing process up until the 20th century. While it is very labour intensive, Letterpress has enjoyed a revival recently and is often used for wedding invitations and business cards. The impression made by pressing the text and images into the paper is now often exaggerated for extra impact. This is the most common printing process today and is sometimes referred to as Litho printing or Offset for short. Offset lithography uses different printing plates for different colours. A black and white design would only need one plate while a colour photograph needs four – Cyan, Magenta, Yellow and Black – which combine together to create all the colours in the image. Special colours and inks can also be used. These are called spot colours and require an extra plate. The cost of creating these plates means that this process is usually not suited to small jobs (or runs) but it is usually the most cost effective method if a large quantity of prints is required. Digital print presses are essentially very big and very fast colour laser printers. Digital printing does not offer the same quality, flexibility and colour control as Offset printing. However, a high quality digital printer will still produce good results and as there are no plates to prepare turnaround times are shorter and set up costs lower. This makes digital printing a good choice for small print runs. Other printing processes include screenprinting, thermography, engraving, gravure, foiling and more. Not sure which print process is right for your job or want to use one of the processes we’ve mentioned but not sure where to start? Get in touch – we’d love to help! Posted on October 19, 2011 by Marie	This entry was posted in blog, design a-z. Keep up to date with the latest curious news and design tips here at the curious blog. Looking for inspiration? Visit curious casa our visual scrapbook where we share the things we like along with ideas and inspiration for our out-of-office projects. Thank you for your interest in Curious Design. We are not accepting bookings for new projects at present but please feel free to browse our site. We have lots of interesting articles on our blog or you can check out our portfolio here. Babytalk festival is an exciting new project for us here at curious design - a new pregnancy and baby festival in Dublin designed, curated and organised by us! Sign up to the curious newsletter to receive news, updates on our recent work and info about special offers.